My recent journey to an all natural lifestyle has led me to The Honest Company. I love everything that this company stands for - educating, empowering and inspiring people to make better choices for their health & families. Their products range from diapers and wipes to vitamins and household cleaners, all honestly free of harmful and toxic ingredients. Living with an athlete can come with its perks - seeing new places, meeting new friends are just a few. But, at the same time, it also comes with some not so fun things, like stink. Stinky gym clothes and even stinkier hockey equipment to be more specific. When doing the laundry, the last thing I want is to put my nice work clothes in with my husband's stinky gym clothes and have my clothes come out smelling and feeling worse than they went in. Thankfully, The Honest Company has the solution. Their 4 in 1 laundry packs have true 4 in 1 performance - cleaning, stain fighting, brightening and softening. The innovative blend of plant and mineral-based ingredients are carefully developed to achieve a superior cleaning experience. Proof that you don't need harsh chemicals to get noticeable results. These prepackaged, and biodegradable, pods are super convenient. I would much rather toss a few pods in my hamper than have to lug my entire bottle of detergent down to the laundry room. They can be used in all washers, at all temperatures, on all colours and all fabric. They are hypoallergenic with no harsh chemical residues, chlorine or fragrances, which means they can be used on all skin types. Perfect for sensitive skin. Just toss & wash! *I am an Ambassador for the Honest Company. This product was provided in exchange for an honest post. All opinions are 100% my own. This post does contain referral links; your continued support of T.O. & fro is greatly appreciated! 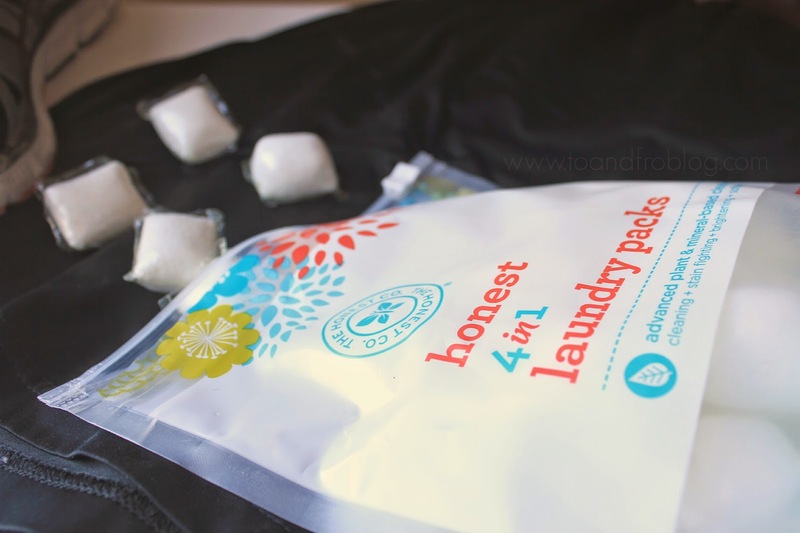 Have you tried The Honest Company? I have to try this! My husband is allergic to...just about everything...so we have to use Tide Free & Clear or whatever it's called. But my clothes never come out smelling fresh! I hate it. I need to try this company. I haven't heard much about them, and I thought they were mainly for babies. I guess they branched out? For real, I thought it was a baby company! I'm stoked! I too thought Honest Company only had baby products. Good to know! Love Honest Company! Our pediatrician suggested using their products because my son's skin is highly sensitive and he gets irritated easily by certain fumes/chemical smells. We haven't looked back! Their cleaning products are awesome!